Within the village of Jemez Springs is the village-owned Jemez Springs Bath House. From primitive and secluded to luxurious and intimate, the Jemez Springs area (less than an hour from Albuquerque) offers a number of hot springs to help visitors rest and rejuvenate both mind and body. 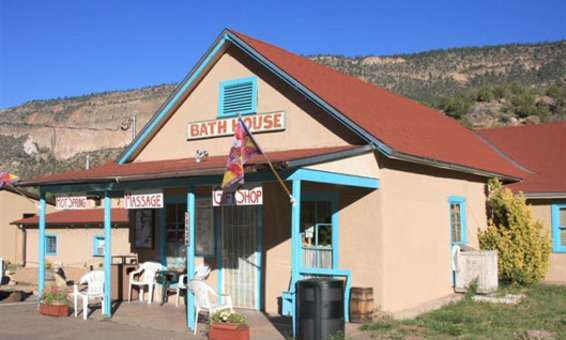 Within the village of Jemez Springs is the village-owned Jemez Springs Bath House. The non-profit facility offers cool or hot mineral soaks and healing massages by licensed therapists in private treatment rooms. Prices start at just $12 for a 25-minute soak. Visit jemezsprings.org or call 575-829-3303 for more information. Along the banks of the Jemez River, Giggling Springs is just steps away from the site of the oldest bath house of the region, constructed more than a century ago. The 20 x 30 foot freeform pool allows for therapeutic soaking in mineral waters of 102-104 degrees. A recently installed Inversion Oxygenation System bubbles in the middle of the pool. This chemical-free disinfection method is just part of an overall environmentally friendly attitude. Even the buildings are geothermally heated. Rates start at just $18 for an hour on the property. Visit gigglingsprings.com or call 575-829-9175 for more information. Looking for a soak even farther off the beaten path? These springs are on public lands managed by the Forest Service. Well worth the walks if you truly like to get away from it all. Call the Forest Service-Jemez Ranger District at 575-829-3065 for the latest information, and be aware that weather sometimes makes access difficult. Take a hike to McCauley Warm Springs, accessible from either Battleship Rock (5 miles north of Jemez Springs on highway 4) or Jemez Falls Campground (14 miles north of Jemez Springs). Park at either location for the roughly2.5 mile hike in to the springs. Or try Spence Hot Springs, 7 miles north of Jemez Springs. Large parking lot on the east side of highway 4, follow the short trail down to the river and up the other side to the springs. San Antonio Hot Springs is 9 miles north of Jemez Springs, turn west at La Cueva onto highway 120. Go approximately 3 miles to National Forest road 376 north springs are located 5 miles north on 376. Note that 376 is typically closed in winter due to extreme snow conditions at that elevation.